« Tattoo You: Hate Points? Get Some Body Art! 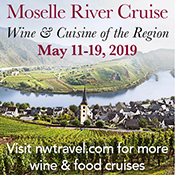 If you take a map of the Bordeaux winemaking region and flip it upside down, it becomes a (more-or-less) mirror-image of the Delaware Bay area that houses the New Jersey’s Outer Coastal Plain (OCP) AVA. Yes, that would be South Jersey. Yes, they make wine there. Better wine than you might at first imagine, actually. Of course, the inverted mirror-image likeness is about as far as the comparison between South Jersey and Bordeaux can go – after that, you have (very) different soils, (wildly) different average temperatures, and (incredibly) different winemaking histories. 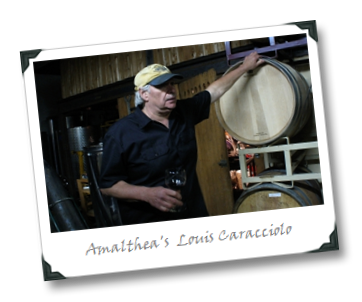 But the point, which was being made to me by OCP winemaker and Amalthea Cellars owner Louis Caracciolo, was pretty clear: if you have a body of water to help mitigate the climate, why not try to make fine wines? Even if it is in Jersey. I recently had the pleasure of visiting Amalthea with fellow bloggers John and Lisa Howard-Fusco, who run the fine locavore-styled website Eating In South Jersey. I was tagging along as the wine guy, helping to assess what they considered to be some of the more promising wines being offered from S. Jersey. The payoff for me, aside from expanding my wine brain and getting to hang out with John and Lisa, was being introduced by John and Lisa to one of S. Jersey’s best worst-kept secrets – roadside BBQ joints (read John & Lisa’s take on the post-tasting BBQ goodness here). At the time of the visit, I’d enjoyed enough of Amalthea’s wines to highlight the OCP region over at the Wine Crush Blog as a spot to watch – or, at least, as some evidence that no self-respecting wine geek should scoff at the notion of quality cool-climate, East Coast reds. “The third wave is an archaic revival to go back to producing the finest grapes by avoiding “overcropping”, crush them, put them into new French or American barrels, add sulfur, maybe egg white, and then allow time to make a wine masterpiece. Very few wines of the world are actually made this way any longer. The advancement of the second wave modified the process with everything from reverse osmosis to centrifuging, to adding a small parade of chemicals, flavors, and colors in many, many of the wines of the world. 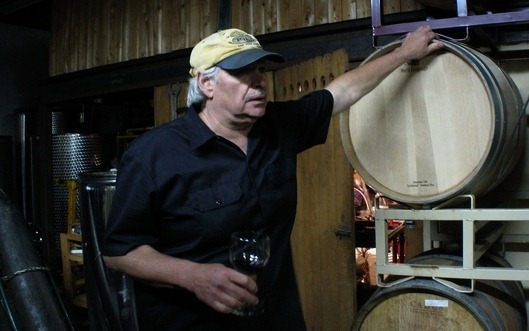 He has a point, of course, and one that is echoed in the ‘natural winemaking’ movement. Having said that, the wave doesn’t always crest, and sometimes come crashing down, because you can only make wine as fine as the grapes that you produce. Like most of the East coast wine producers I’ve encountered, Amalthea is still experimenting with what works best and as a result offers probably too many wines over too broad of a quality spectrum. Those wines ranged from terrible (the 2007 Sauvignon Blanc, which was an acid bomb with little personality) to decent (a promising 2006 Cabernet Franc Reserve with a nice red fruit profile) to downright exciting (the 2007 “Europa III”, a fleshy, dark fruited beauty made primarily from Merlot and sporting sweet spice to give it a complex edge). Now, you might be thinking that no one is going to be confusing South Jersey with Bordeaux anytime soon, but according to Caracciolo that’s exactly what happened in blind tastings conducted in the Summer of 2008, in which Amalthea fared better than some big-name producers from Burgundy, Napa and Bordeaux. It would be interesting, I thought, to conduct another blind tasting like that with more press around. Especially if I could enjoy more NJ roadside BBQ pork directly afterward. I don't think it goes against the idea of terroir at all – my understanding of Louis' view is that the "third wave" idea is to minimize the impact of the winemaking process and let the "message" of the grapes come through. So theoretically that style would reinforce the terroir concept. Yep Terroir is front and center to the Third Wave…and I would like to accept the chalenge of another blind tasting against the worlds best….and pack the place with the press….the Wine Spectator was at the "Taber" event June of 2008 and killed the story…not a suprise….not in their best interest to make public that $25 NJ wines were/are beating the best (overpriced ) wines from Napa and France. Hey Lou – thanks for chiming in! I *love* the idea of another tasting (blind, of course). I should not before we discuss it any further that I do not have the cash to bankroll recent vintages of the best from Napa and France, though :). Hi, followed you here from John and Lisa's link. Thanks for educating the rest of the world that NJ is producing some good wine. Amalthea is one of our wineries that I haven't had the pleasure of tasting from yet, so I'll definitely be looking for them this weekend at the Jersey Fresh Food & Wine festival and make sure I give the Europa III a taste. Enjoyed this piece. I found that after four years of trying various wineries in Jersey, finally a good one on the wine road. He is on to something, and so I have been turning our wine friends on to them as well. Lisa and John make great food buddies!